Introducing the new FranklinCovey® Collection, stylish writing instruments crafted exclusively by A.T. Cross for FranklinCovey, world leader in time management and organization. to appeal to a broad range of consumers. 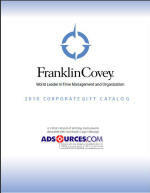 A gift bearing the FranklinCovey name instantly celebrates individual or corporate achievement and success, and the lifetime mechanical guarantee assures many years of writing pleasure.